Recommended to athletes, sports fans, health nuts, and of course, pop culture junkies. In America, we define ourselves in the superlative: we are the biggest, strongest, fastest country in the world. Is it any wonder that so many of our heroes are on performance enhancing drugs? Director Christopher Bell explores America’s win-at-all-cost culture by examining how his two brothers became members of the steroid-subculture in an effort to realize their American dream. 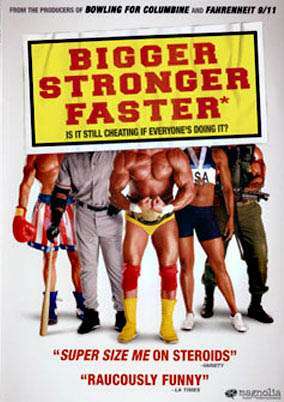 The documentary examines the steroid use of the director Christopher Bell and his two brothers who all grew up idolizing Arnold Schwarzenegger, Hulk Hogan, and Sylvester Stallone, and also features professional athletes, medical experts, fitness center members, and US Congressman talking about the issue of anabolic steroids. Beyond the basic issue of anabolic steroid use, Bigger, Stronger, Faster* examines the lack of consistency in how America views drugs, cheating, and the lengths people go to achieve success. This includes looking beyond the steroid issue to such topics as Tiger Woods laser eye correction to 20/15 vision, professional musicians use of anxiety reducing drugs, or athletes’ dependence on cortisone shots, which are a legal steroid. The film also takes a skeptical examination on claims to the health risks of steroids and is highly critical of the legal health supplement industry.